In the aluminum industry, the aluminum liquid Degassing Machine and other equipment are installed with a plurality of diffusing gas permeable bricks, and an inert gas such as nitrogen or argon is blown. The aluminum liquid is turned over, the impurities are floated, and the hydrogen is greatly dehydrogenated, which can greatly improve the quality of the aluminum alloy. Using this bottom breathable refining technique, the bubbles have no dead ends, small and numerous. Rolling up and down, uniform aluminum liquid temperature, aluminum alloy performance is greatly improved, and achieved good economic benefits. The device has a simple structure, does not pollute the aluminum liquid, and has low use cost, long service life and simple maintenance. It is widely used in the casting of aluminum alloys in China. During the smelting process, the aluminum metal reacts with the water vapor to generate hydrogen gas and dissolves into the aluminum liquid. When the aluminum liquid solidifies, the hydrogen gas is removed from the aluminum liquid. If the hydrogen content in the aluminum liquid is too high, the pores are easily formed in the casting, and the mechanical properties of the casting will be degraded. In severe cases, the casting is scrapped, and hydrogen is a harmful gas in the aluminum liquid. 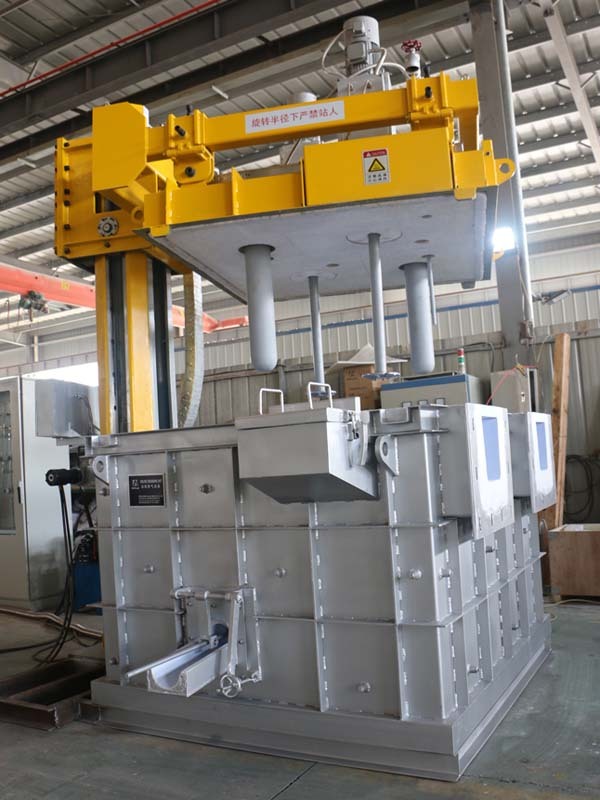 The pre-furnace detection of the hydrogen content of the aluminum liquid is an important process to ensure the quality of the casting, especially in the precision die casting process, the use of the aluminum liquid degassing box to remove hydrogen and slag will become indispensable. Auto parts die-casting, aluminum alloy die-casting products, lighting aluminum alloy casing, aluminum alloy spotlight shell, auto lamp aluminum alloy shell, LED lamp aluminum alloy lamp shell, aluminum alloy die-casting heat sink, aluminum alloy die-casting tool, aluminum alloy die-casting fitting, pure Aluminum die-casting heat sinks, precision auto parts and other aluminum casting smelting processes. The aluminum liquid is stirred by a controlled rotating graphite shaft and a rotor, and the metered inert gas is pressed into the aluminum liquid through the rotor and dispersed into fine bubbles, which are uniformly dispersed in the liquid metal, and the gas partial pressure of the bubbles is zero. Since the partial pressure of hydrogen in the aluminum liquid is high, the hydrogen in the aluminum liquid continuously diffuses into the bubbles, and at the same time, some non-metallic inclusions in the aluminum liquid are adsorbed on the surface of the bubble, and inertness of useless hydrogen and some non-metallic inclusions adheres. The gas bubbles float up to the surface. When there is a special degassing filter box, these impurities are isolated before the pouring, and then the desulfurization and deoxidation inclusions are achieved by the slag. The degassing principle is also recognized, the efficiency is high, the effect is good, the production process is not affected, the purity of the aluminum liquid can be improved in a short time, the scrap rate is reduced, and the production efficiency is improved. Improving the mechanical properties of castings and enhancing the competitiveness of products is something that traditional degassing methods cannot achieve.